Steve's unique formation meant different physics were at play. Steve is a narrow, east-west running ribbon of purple light, sometimes slivered with green. And it looks nothing like the wispier, wider curtains of other auroras. Aurora-chasers in southern Canada who first spotted it started calling the mysterious streaks “Steve” after a joke in a 2006 animated film. Between 2015 and 2016, these citizen scientists sent some of their photos to Elizabeth MacDonald, a NASA space physicist, through her playfully-named citizen science platform Aurorasaurus. After looking at over 30 reports, she knew that something different was going on. Normally, auroras occur when energized particles from the sun interact with the Earth’s magnetic field. But at didn’t explain Steve’s purple streaks. Different physics must be at play, MacDonald concluded. 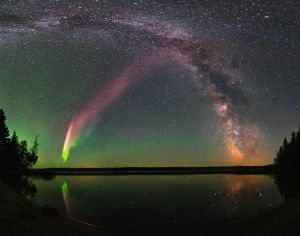 But scientists didn’t know what made Steve special until July 2017, when, just by chance, one of the European Space Agency’s Swarm satellite set up to study the Earth’s magnetic field, happened to pass right over an area where the mysterious purple streaks were showing up. Using Swarm data, MacDonald and her colleagues found that Steve appears when solar particles are moved rapidly from east to west by the interaction of both electrical and magnetic fields. This interaction only happens at points around 60 degrees north of the equator. Researchers have known about this flow of hot, fast-moving particles since the 1970s. They’re usually given the (way less fun) name of sub auroral ion drift, or SAID — but scientists never knew that there was any visual phenomena associated them. Luckily, MacDonald’s team decided to keep the more fun name by way of an acronym: Strong Thermal Emission Velocity Enhancement (STEVE). It was only thanks to smartphones and high-quality digital cameras in the hands of passionate citizen scientists that physicists were able to realize what’s been under our noses — or, rather, over our heads — all along.